I am presently in a place on this planet where I feel comfortable, a safe place far away from the scheming nations who have turned a blind eye to the exploitation of our oceans. The German government said I betrayed their trust by leaving Germany, yet they had already betrayed my trust. 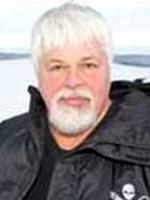 The German politicians had made up their minds politically before the German court had made a decision, and during the time I was held in Germany, the Japanese negotiated with Germany to file for an extradition order to Japan on fabricated evidence provided by former Sea Shepherd Crewmember, Peter Bethune. In 2010, the Japanese ship Shonan Maru #2 deliberately rammed and destroyed the Ady Gil, nearly killing 6 people. The Japanese captain was not even questioned, damages were never paid, no charges were filed and they took the Ady Gil captain, Peter Bethune, back to Japan where he cooperated to provide false evidence to the Japanese Coast Guard to blame me for the boarding actions, despite the on-camera documentation that I specifically advised against the boarding by Bethune. We have cost the Japanese whaling industry tens of millions of dollars and in October 2011, they were allocated a war chest of some US$30 million in misappropriated Tsunami Relief Funds to combat Sea Shepherd. With that money they have increased security at sea, filed civil suits in the U.S. Courts against us, and they have researched just where we might be vulnerable. And the one possibility they found was a decade-old incident that occurred in Guatemalan waters in 2002. This charge simply involves obstructing a Costa Rican long-liner with water hoses. It was an action that occurred with permission of the Guatemalan government and it was against a fully documented illegal shark-finning operation that was also filmed for the award-winning documentary film, “Sharkwater.” It was against a vessel that only a year before had been convicted of shark-finning in the waters of the Galapagos National Park Marine Reserve, where our vessel the Sirenian had helped to apprehend them. Japan had previously tried to have me arrested by Interpol for the Bethune incident but Interpol refused their request for a ‘red’ notification, allowing them only a ‘blue’ notice, meaning that countries could report my movements to Japan but could not arrest me. In December, the President of Costa Rica met with the Prime Minister of Japan. I had attended the Hamburg Film Festival in November 2011 without being arrested in Germany. In March I traveled to Spain and France without incident. Yet in May of 2012, I was arrested in Germany on an extradition warrant from Costa Rica. And what I found was that Costa Rica, like Japan, had issued an Interpol notice and Interpol at the end had dismissed the request. Germany however, a country without an extradition treaty with Costa Rica or Japan, decided to apprehend me on what they described as a bilateral agreement with Costa Rica. This, of course, caught Japan’s attention and they began negotiations to apply directly to Germany with a request for my extradition. That request by Japan was approved by Germany on July 23rd, 2012. I was alerted to this by reliable sources on July 22nd. With Costa Rica, I had the evidence on film and with two dozen witnesses I was confident that I could win the case against the allegations of the shark finners. My only concern was that Costa Rica would then hand me over to Japan. For with Japan, there is the absolute certainty that once in Japanese custody, I will never be released. That certainty meant that there could only be one option: I made the decision to depart Germany immediately. I find it absurd that in all the years I have been campaigning for the protection and conservation of marine life, where I have not caused a single injury to a single person and have only interfered with illegal operations as defined by international conservation law, that Japan can make accusations against me after destroying a two-million-dollar vessel, injuring a crewmember and almost killing five others. I am very disappointed with the German government. For me it is obvious that the German government conspired with Japan and Costa Rica to detain me so that I could be handed over to the Japanese. For me it is clear that they made the political decision to turn me over to the Japanese even before a court decision was made. All the German people that I have met were supportive of the work I do. I did not meet a single critic in the streets, in the courts, in the media or at any of the events and presentations that I attended. Even the police and members of the court were supportive. I am very thankful for the support that I received in Germany and especially from the sympathetic sources that provided me with the information about the decisions made and the impending political decision to accept the Japanese demand to extradite me to Japan, once a court decision would be on their desk. This was never really about Costa Rica. It has been about Japan all along. We have confronted the Japanese whalers for eight seasons and we have humiliated them at sea and more importantly we have frustrated their illegal profiteering from the killing of whales in the Southern Ocean Whale Sanctuary. This is not about justice; it is about revenge. It is about a small group of dedicated volunteers opposing an economic superpower and a multi-million-dollar whale poaching operation in a whale sanctuary. It is about speaking truth to economic and political power. Costa Rica and Germany have simply been pawns in the Japanese quest to silence Sea Shepherd in an attempt to stop our annual opposition to their illegal whaling activities. I know the whale killing poachers of Japan will continue to exploit all avenues to find a way to stop me. I have, however, eluded them once again and I will continue to try and keep a step ahead of them, no matter what risks and costs have to be made. I can serve my clients better at sea than in a Japanese prison cell and I intend to do just that. In December, our ships will sail forth for the ninth campaign to oppose the outlaw Japanese whalers in the Southern Ocean Whale Sanctuary. The campaign will be called Operation Zero Tolerance and we will risk our ships and our selves yet again in the effort required to stop these pelagic bandits in their remorseless slaughter of the gentle giants of the seas.